The touchscreen on your iPad might be easier to type on than that of an iPhone, but it’s still a touchscreen – which means it’s still a pain in the neck. 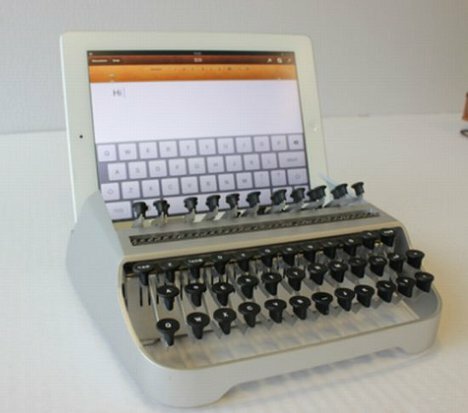 Designer Austin Yang wants to bring back the old-school satisfaction of a typewriter’s click-click-click, so he created a typewriter-style dock. The dock holds an iPad and allows you to hunt and peck away, just like you used to on a typewriter (if you’re over a certain age) or a physical keyboard. The idea is actually really fun, but the actual product is not as great as it could be. The keyboard doesn’t have the QWERTY setup we’re all used to, and things like the space bar and punctuation look to be located in odd places. Still, if you don’t mind hunting and pecking for what seems like a really long time, the cool dock does give you the satisfaction of pushing physical buttons to type, something the iPad just can’t offer on its own.